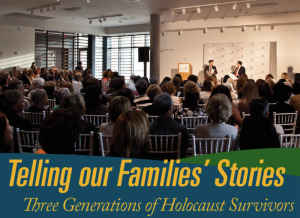 The Holocaust Awareness Museum and Education Center in partnership with the National Museum of American Jewish History is pleased to present “Telling our Families’ Stories,” in which panelists will be speaking about their personal or families’ experiences before, during, and after the Holocaust and discuss what motivates them to keep the stories alive. Join us for a panel discussion including Holocaust Survivor Daniel Goldsmith, Shari Glauser, daughter of Holocaust Survivor Kurt Herman z”l, and Avi Wisnia, grandson of Holocaust Survivor Cantor David Wisnia. After the presentation, there will be options for a docent led tour of the Dreams of Freedom galleries and an opportunity for attendees to do a short video about their own families in the It’s Your Story booth or respond to questions in the Contemporary Issues Forum. Pre-registration requested due to space limitations. Please contact Tammy Forstater at HAMEC at 215-464-4701 or email tammy@hamec.org to register and for further information. Read about my recent travels to Poland with my grandfather in the #MyPolishWisnia blog: HERE. 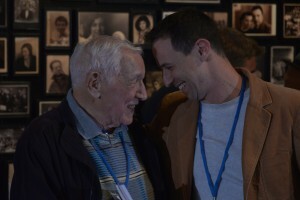 My grandfather’s Holocaust memoir is now available at www.onevoicetwolives.com. Posted Saturday, April 2nd, 2016 under Uncategorized.